Crispy, crunchy, and oh-so-delicious! 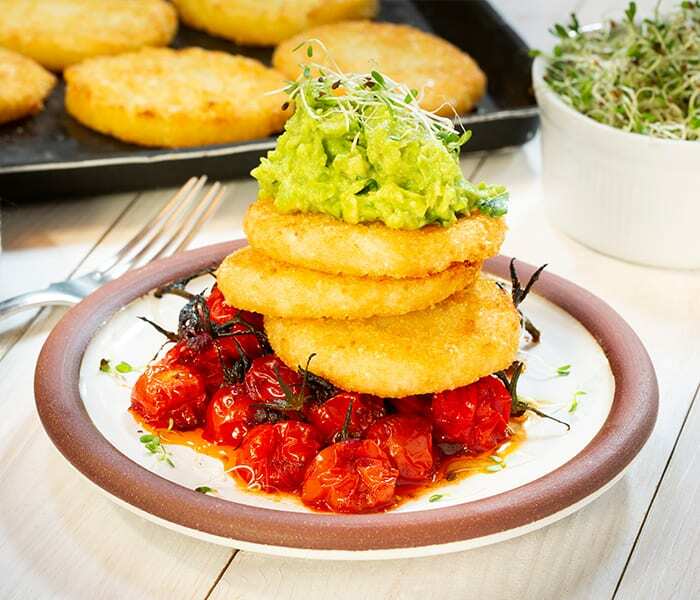 Our Cauliflower Hash Browns offer a healthy alternative to your traditional potato fare, serving up plenty of fibre in each spectacular bite. Great for lunch or dinner, you’ll leave the table feeling full and energised, but probably wanting more! Preheat the oven to 150°C. Place the tomatoes on a baking tray. Mix the harissa paste, the olive oil, honey or maple syrup, balsamic vinegar in a bowl and coat the tomatoes. Roast for 35-40 minutes, the longer the better as the tomatoes start to caramelise. In the meantime, smash the avocado, add the juice of one line and the salt and pepper. Turn the oven to 200°C and place the Cauliflower Hash Browns on a baking tray, cooking for 15-17 minutes, until golden.